20 Years After China Seized Boy Monk, Tibetans Call For His Release : The Two-Way In 1995, Gedhun Choekyi Nyima was designated as the 11th Panchen Lama, Tibetan Buddhism's second-highest spiritual leader. He was promptly detained by Chinese authorities and never heard from again. Members of Exile Tibetan Women Association protest to demand the immediate release of Gedhun Choekyi Nyima, the 11th Panchen Lama, during a gathering to mark the 20th anniversary of his disappearance, in New Delhi, India, on Sunday. Two decades after a 6-year-old boy designated as Tibetan Buddhism's second most important spiritual leader was swept up by Chinese authorities and never heard from again, the Dalai Lama's government-in-exile has renewed a call for his release. Gedhun Choekyi Nyima, who would be about 26 years old today, was chosen as the 11th Panchen Lama in 1995 after a lengthy search conducted by senior Tibetan monks determined him to be the reincarnated soul of the post's deceased predecessor. On the anniversary of Gedhun's disappearance, Penpa Tsering, the speaker of the Tibetan Parliament in Dharamsala, India, appealed to the Chinese government to release him. 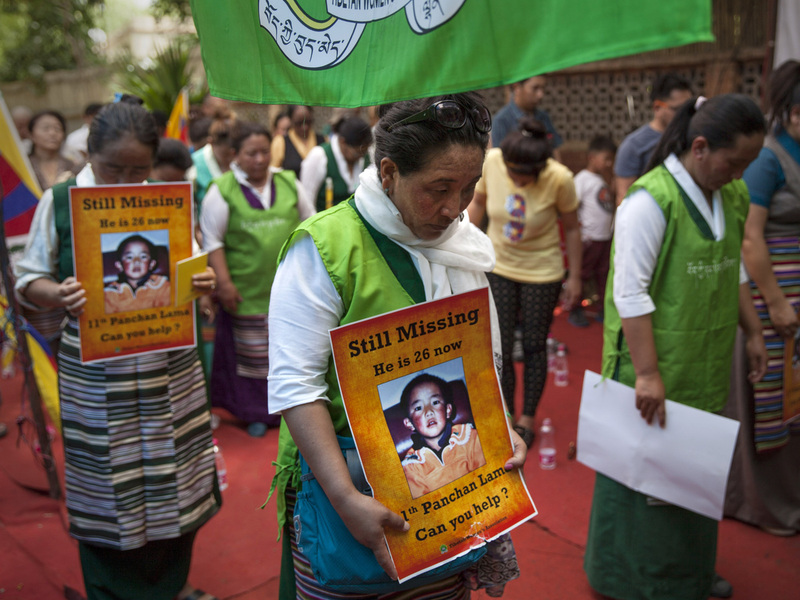 "I believe that the efforts of the Chinese government in keeping the Panchen Lama in a secret location is to deprive him of all the religious [training] that he [needs] to undertake so that he can teach to the future generations of Tibetans," Penpa said. He said he believed China hoped to keep the Panchen Lama from learning the Tibetan language "so that he would not be in a position to communicate directly with the Tibetan people in the future." China's choice for Panchen Lama, Gyaincain Norbu, has been largely rejected by Tibetans living outside of China. He debuted on the international stage in 2006, urging Tibetans to work toward unity with China. And, six years later, speaking at the World Buddhist Forum in Hong Kong, he criticized "materialistic technology" and said greed had "unbalanced the ecosystems, contaminated the environments, caused natural disasters, spread epidemics, induced wars and hence endangered all sentient beings now and in future", according to a transcript of the 8-minute speech.